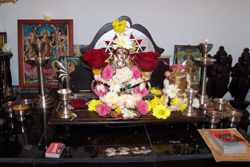 Mangala Gowri Puja 2012 dates are – 24th July 2012, 31st July 2012, 7th August 2012 and 14th August 2012. Mangala Gowri Vratham is done on every tuesday in sravanamasm. Mangala Gowri Vratham is dedicated to goddes parvathi. 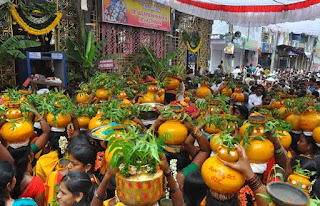 The Mangala Gowri Vratham is done only by married womens. On the auspious day woman wake up early clean the house and took head bath, Then prepare nivedyam to Mangala Gowri. The method of puja and mantras used vary from region to region. Newly Married women observe Mangala Gowri Puja in the first five years of their marriage. If You miss a tuesday it can done on friday. The puja room is decorated with rangoli, keep a plate spread a blouse piece over it then pour a cup of rice over it place a silver Mangala Gowri or turemeric Mangala Gowri. Decorate the Idol with flowers, Then two more blouse pieces folded in triangle shape placed at a side of plate. Then kalasa is prepared, kalasham composed of rice, coins, five different kinds of leaves, and beetle nut top covered with coconut. The sides of coconut arranged with mango leaves. the coconut is cleaned smeared with turmeric and kumkum. They will offer puja to Lord Ganesh before performing Gowri puja. As lord ganesh is the primary god.
" Sarva Mangala Mangalye "
Chant the Guari Ashtottarams with kunkuma and turmeric. The puja is done with the intention that Goddess Gowri will bless the house with material prosperity, health and long life.